NEW Code SEVENSCENT – Receive a free fragrance sample set, with any online merchandise purchase of $35 or more. NEW Code BEBRIGHT – KIEHL’S SINCE 1851 Clearly Corrective Dark Spot Solution Sample Set – 7 x 1.5ml. Free with $35 purchase. NEW Free Clinique set with any Clinique foundation purchase. This entry was posted in Sephora, Store Event and tagged sephora promo code. Receive a FREE 5 Pc Benefit Gift with any $50 online purchase. One per customer. While quantities last. This entry was posted in Store Event. Ulta: Get the Free 10 pcs sample bag with only $21.50 purchase + Free Shipping for Diamond members! Thanks to LMarie for this hot tip! Thank you!!! Let me show you how to get the FREE 10 Pc Sampler bag with only $21.50 purchase! Add 10 Sweet & Shimmer items to your cart. They are Spring Hall Event items and buy 5 for $10. The before discount total of $49.99 counts toward the threshold of the free 10 pcs sample bag! Add another low-value Spring Hall Event item that you are willing to buy. Add more Spring Hall Event items(that you don’t want to buy) to the cart. Reach the total to $50 and let the free 10 pcs sample appear to the cart. Remove the items you don’t want. The Free 10 pcs sample will stay! My cart, total $21.50 + free shipping(diamond member) + free 10 pcs sample bag! Receive a FREE 10 Pc Sampler with any $50 Spring Haul online purchase. One per customer. Offer valid 4/16/19 through 4/19/19 or while quantities last. Ulta After Dark Beauty Break! Receive a FREE 4 Pc Soap & Glory Gift with any $50 online purchase. One per customer. While quantities last. And, receive a FREE Beauty Bag with any $30 online purchase. A $32 value! Macy’s is running 48 hours sale + free shipping with $48 purchase. Ends 4/13. Click here to the 48 hours sale beauty page. Click here to the gift with purchase page. Currently, they have free 19 pcs samples with $95 women’s beauty purchase and free 11 pcs gift with $95 men’s beauty purchase. There is another nice one – Buy Full-Size Mascara, Receive a Free Full-Size Instant Lip Perfector, a $26 value. Be sure to pick up your shade during check out. 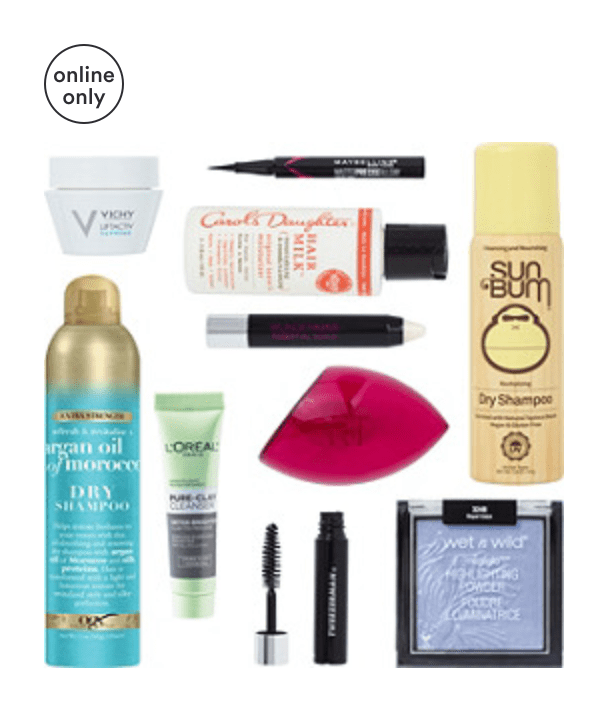 NEW Receive a FREE Beauty Bag with any $30 online purchase at Ulta.com. A $32 value! One per customer. While quantities last. The FREE 10 Pc Sampler with any $40 Spring Haul online purchase is currently SOLD OUT! NEW Receive a FREE 10 Pc Sampler with any $40 Spring Haul online purchase. One per customer. Offer valid 4/11/19 through 4/15/19 or while quantities last. And, you can get this bag free with $20 Single Masks(Spring Hall items only) purchase! Why? Because the $40 threshold will take the total of B2G2(Free) before the (Free)discounts. Here is my cart, if you are Diamond member, just add another $5 item to get free shipping. Sorry, the $3.50 off $15 doesn’t work on the Spring Hall Event items. Nice sales at Nordstrom! Mega PRO Palette 3 is 40% off + select BECCA are 50% off + Lime Crime Venus Palettes are 50% off! Also, receive deluxe samples of Sunlit Bronzer in Capri Coast (0.08 oz.) and Backlight Priming Filter Face Primer (0.2 oz.) with your $35 BECCA purchase. Online only. Choose 1 of 3 free 11 pcs gift with $65 purchase. They are currently marked as sold out, I suggest you check later! OPTION 1: Receive a FREE 11 Pc Cool Indie Beauty Sampler with any $65 online purchase. Over a $115 value! One per customer. Offer valid 4/10/2019 or while quantities last. OPTION 2: Receive a FREE 11 Pc Electronic Pop Beauty Sampler with any $65 online purchase. Over a $115 value! One per customer. Offer valid 4/10/2019 or while quantities last. OPTION 3: Receive a FREE 11 Pc Nonstop Rock Beauty Sampler with any $65 online purchase. Over a $115 value! One per customer. Offer valid 4/10/2019 or while quantities last. NEW Platinum/Diamond members, check your email for early access 20% off coupon code, the code is unique! Ends 4/18. CosmoCube® Posh Pink Edition Cosmetic Organizer is 50% off for $99 at Nordstrom. Free shipping with $49 beauty purchase OR pay online and free pickup in-store. Clinqiue GWP – Free 7 pcs w/$27 Clinique purchase + 2 pcs duo w/$55 purchase + free tote bag with $100 Clinique purchase. Click here to the gift with purchase page. Select NYX are 50% off. Click here to the Beauty Sale page. Free shipping on all beauty purchase. Click here to the gift with purchase page. Click here to the coupon page. Estee Lauder GWP – Free 7 pcs gift with $37.50 EL purchase. Check out the beauty sale page here. 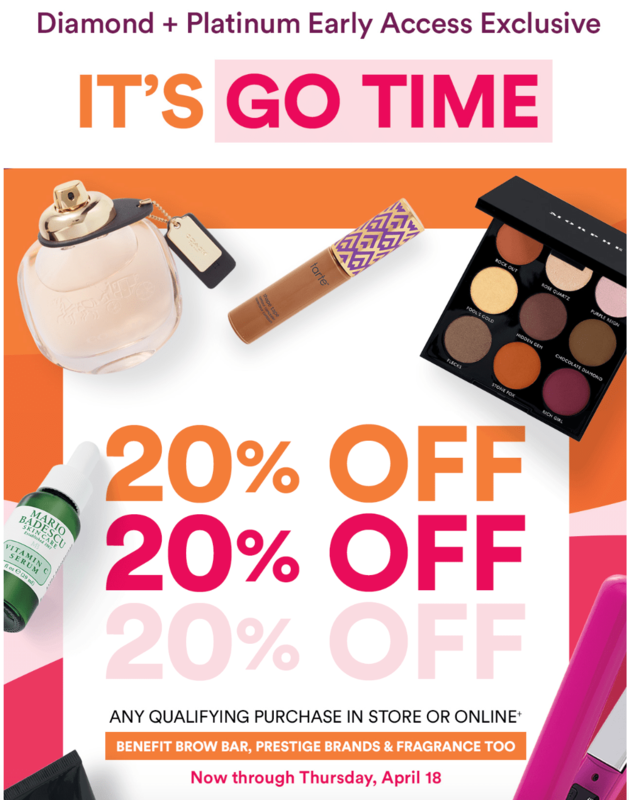 Select NYX are up to 70% off. Some Lancome are 50% off. Free shipping on any purchase. Click here to the Sale Page. Estee Lauder GWP – Free 7 pcs gift with $37.50 purchase. Free shipping on any purchase through 4/14. Plus, take $15 off every $150 spent in beauty. Ends 4/14. Discount will be automatically applied at checkout. Many new GWPs are added. Click here to the gift with purchase page. Click here to the beauty sale page. Free shipping with $49 beauty purchase. Click here to the gift with purchase page. Click here to the beauty sale page. 15% off beauty with code FRIENDS, ends 4/20. Free shipping on any purchase. Click here to the gift with purchase page. Click here to the beauty sale page. Nordstrom just added a free gift set ($188 Value) with $125 beauty purchase. This really sweetens the current free 10 pcs fragrance deluxe sample(use code PINK or YELLOW) with $85 fragrance purchase offer + a free NEST mini defuser with $100 fragrance purchase. The entire the Balm brand is 50% off at Stage Stores. There are a couple of items 75% off! Free shipping with $75 purchase OR Free Shipping to Stores on select items. Click here to the 50% off beauty doorbuster sale. Click here to the gift with purchase page. There is free 7 pcs gift with $37.50 Estee Lauder purchase. Click here to the coupon page. Surratt select items are 50% off at Sephora in JCP. Free shipping with $99 purchase. Click here to the Sale Page.